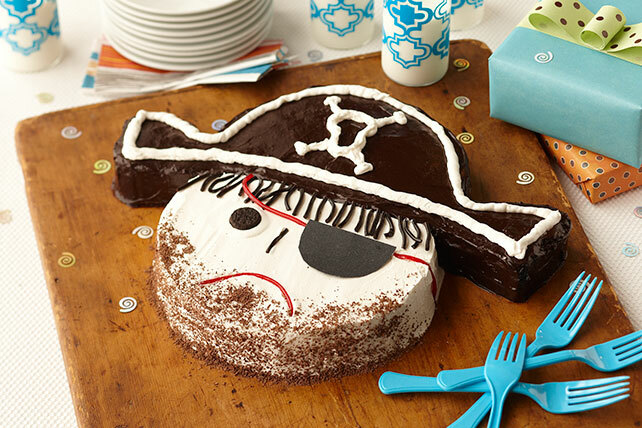 No fancy cake pans required to make this birthday cake for your little buccaneers! We used two standard round pans. Prepare cake batter and bake as directed on package for 2 (9-inch) round pans. Cool cakes in pans 15 min. Remove from pans to wire racks; cool completely. Cut cake as shown in diagram. Discard cake trimmings or reserve for snacking. Place head piece on platter; frost with 1 cup COOL WHIP. Beat dry pudding mix, sugar and milk with whisk 2 min. Assemble hat pieces near head as shown in photograph; frost with pudding mixture. Spoon remaining COOL WHIP into resealable plastic bag. Cut small corner off bottom of bag. Squeeze bag to pipe COOL WHIP onto hat as shown in photograph. Cut eye patch out of piece of sturdy colored paper or cardboard. Cut 14-inch length from red licorice. Use to "attach" eye patch to cake. Use remaining red licorice to form mouth. Decorate cake with remaining ingredients as shown in photo. Keep refrigerated. This cake is sure to be a hit at your child's next party. At 12 servings, it makes enough to feed a crowd. Add a Mini OREO Bite Size Cookie to the pirate's chin to create an unsightly mole.